Discovered years ago on Epicurious, this recipe is a Liv Life Thanksgiving tradition. Sweet, but not cloyingly so, these orange laced potatoes are topped with a lovely toasted almond streusel and are healthy enough that seconds won't make you feel guilty. Preheat oven to 375ºF. Pierce sweet potatoes in several places with either a fork or sharp knife. Place on a baking sheet lined with foil and bake until very tender, about 1 hour. Remove from oven and allow to cool. Peel the potatoes when cool enough to handle, discarding the peels. Place the peeled potatoes into a large bowl and mash. Add the fresh juice, orange peel, butter, 1 Tbs brown sugar and Grand Marnier and combine either with a large wooden spoon or a hand mixer. Pour into a prepared baking dish. May be made 1 day ahead and chilled. For the streusel, place all of the streusel ingredients into a food processor and pulse until small moist clumps form. Transfer to a small bowl and cover. May be made up to two days ahead. When ready to bake, preheat oven to 400ºF. Remove potatoes and streusel from the fridge and scatter the streusel over the potatoes. Bake until the potatoes are hot and the streusel is toasted (crisp and lightly browned), 30-40 minutes. Allow to cool for about 5 minutes and serve. Enjoy! 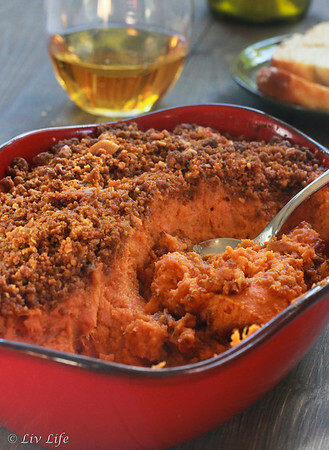 Your Sweet Potato dish looks wonderfully tasty, and I like the streusel topping. 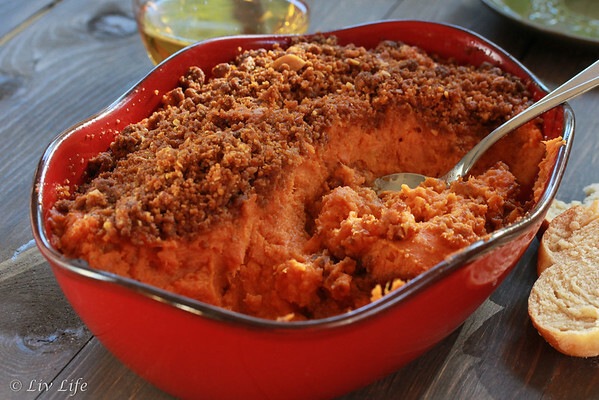 A much healthier version that candied sweet potatoes. I used to make the candies sweet potatoes hyear, but we have now switched to Balsamic Roasted veggies, sweet potaoes, Brussells sprouts, carrots, red onion, etc. so good, and much more healthy. Have a Happy Thanksgiving with your family! I can see why this is served each Thanksgiving at you dinner table...they sound delicious. I hope your Thanksgiving is a wonderful one. I love EVERYTHING about this recipe, Kim! sounds so flavorful, and that streusel?! yes please!